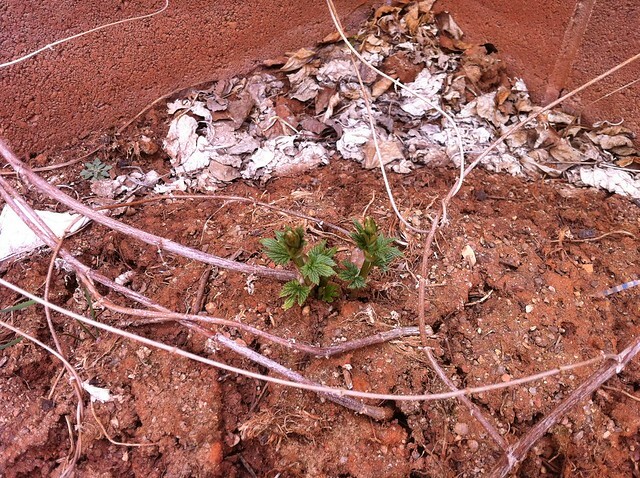 Some great news on the gardening/brewing front, at least 9 out of 10 of our hops plants lived through the winter. I have to admit being pleasantly surprised. We had some very cold days this winter -44 fahrenheit according to our outdoor thermometer, and even in the photos I have uploaded you can see frost heave in the hops bed. We planted 5 varieties of hop rhizomes last year, and were very lucky getting a reasonable batch of hops for brewing in our first year from two of the varieties. I am pleased to see that all of the varieties have survived, though one plant hasn't yet broken the surface - we will have to see if it catches up later, or if it is a casualty. © 2019 The Rogue Gourmet. All rights reserved.